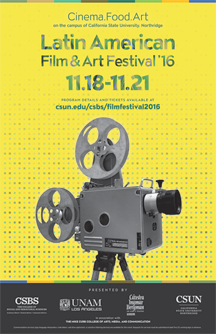 California State University, Northridge’s Department of Cinema and Television Arts presented its third annual Latin American Film Festival, Nov. 11-21. In collaboration with CSUN’s College of Social and Behavioral Sciences and Universidad Nacional Autónoma de México en Los Ángeles (UNAM-LA), the festival screened notable films from Latin-American countries such as Brazil, Mexico, Chile, Cuba and Colombia. The festival kicked off on Nov. 18 with a viewing of the musical drama The Violin Teacher, a Brazilian production by acclaimed writer and director Sérgio Machado. On Nov. 19, the Armer Theatre screened Maraka’ame’s Dream, a Mexican UNAM production, and You’ll Never Be Alone, a Chilean drama on the lives of LGBT individuals. On Nov. 20, the Mexican animated feature The Incredible Story Of Stone Boy delighted the younger audiences of the festival and was followed by the films The Companion and Alias Maria, official selections for the 2017 Academy Awards. The festival concluded Nov. 21 with the screening of Kill Me Please, a Brazilian drama about a teenager growing up in Barra da Tijuca, in the West Zone of Rio de Janeiro.